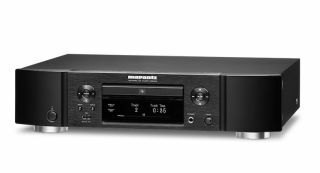 Marantz introduces ND8006 network CD player | What Hi-Fi? Marantz’s latest do-it-all streaming solution doesn’t ditch the disc drive. Nowadays, streaming solutions carry as much pressure to deliver in every respect as world-class heptathletes – something Marantz is clearly well aware of. Through either an Ethernet or dual-band 2.4/5GHz wi-fi connection, its new ND8006 offers network streaming from a NAS drive or streaming service such as Spotify, Amazon Music, Tidal or Deezer. There’s also AirPlay, Bluetooth and internet radio as well as, of course, CD playback. Support for Denon’s HEOS wireless multi-room platform allows streaming to multiple compatible HEOS speakers around a home via the dedicated app. And as far as physical connections go, an internal DAC is fed by twin optical and coaxial inputs, as well as a USB type-B socket for hooking up a laptop. Such versatility extends to file format support too, reaching all the way up to DSD11.2Mhz and PCM 32bit/384kHz. As the ND8006 doesn’t have built-in amplification, it isn’t quite a just-add-speakers solution like the Onkyo TX-8250 or Naim Uniti Atom. However, there’s a degree of system flexibility – it can plug straight into an integrated or pre/power amplifier via its fixed level output - or, thanks to its built-in volume control, into a power amplifier or pair of active speakers via its variable output. If you’re choosing to go down the former path, Marantz might point you to its PM8006 integrated amp – not least as the ND8006’s remote control is able to control both units. A dedicated headphone amp features selectable gain, can drive a wide range of headphones, and has ‘H/P off’ mode designed to ensure optimal performance when the headphone stage isn’t required.